HIIT and Interval Training…Reap the Benefits! Hello everyone! I’ve been exploring Pinterest recently and have discovered quite a lot of interesting content. In particular, there is this chart that I found describing two types of cardio training. High Intensity Interval Training (HIIT) and Interval Training. Both training methods are extremely beneficial and help to add some variety to your workouts when you hit a plateau. Are you ready to try? I’m whipping out my running sneaks! One of my absolute favorite places to shop when I am in need of some new workout gear that is functional, and feminine, is Athleta. Athleta is a brand affiliated with Gap that specializes in female athletic-wear. Similarly to their sister-sites (Gap.com, OldNavy.com, and BananaRepublic.com), their webpage is easy to navigate and allows to you to pinpoint exactly what you want to buy and offers you an in-depth list of details of each piece of clothing you are purchasing. Plus, super-fast shipping! For me, I am looking for good-quality workout gear that is durable, comfortable, and above all else, fashionable! Just because you’re at the gym or on the court doesn’t mean you have to sacrifice your appearance. The following is a list of my favorite picks from the site. I enjoy a lot of different sports, running, rowing, tennis, yoga…so this list will include items from a lot of different categories. Enjoy! Color blocking, even on the court. I LOVE it. Hello all! Here’s another installment of my Disney-inspired princess outfits. Today’s inspiration: Belle from Beauty and the Beast. Just to clarify, each outfit has a hint of each princess that has been combined with my own personal style to create each look. I loved this ModCloth dress with the blow detail that cinches the waist while the rose accessories remind us of the classic Disney film. Finishing off the look with bright red lips completes the look, creating some of that glam-factor. Do you ever find yourself with endless amounts of your boyfriend’s tee-shirts that have mysteriously compiled over the years that you can’t bear to let go of? Why blame yourself? They’re way more comfortable to sleep in, they have sentimental value, AND they have the most amazing, witty, and hilarious graphics on the front of them. Here are some classics that I think will put a smile on your face. Do I even need to explain how amazing this shirt is? I mean…come on. It’s Star Wars. Enough said. With the release of Superhero movies on the horizon in July, and the Avengers earlier this summer, Superhero tees are perfect to wear if you want to really represent for your guy’s favorite hero on a movie-date. Another good tee to snag from your boyfriend’s collection are any that have to do with video games. Since most of the male population have a fascination with video games, he will appreciate being able to see his favorite girl being dressed in his favorite characters. Trust me, there’s nothing more adorable to a guy than seeing his girlfriend wearing his oversized tees. I don’t know why, that’s what I’ve been told by my male friends. So while he isn’t looking, just sneak over to his tee-shirt drawer and take a peek or two! Not all of us are the biggest heel enthusiasts, and I’m sure our poor feet can speak to that! Sometimes, on a laid-back summer day, you just want to slip on a nice pair of flats. Here are some more Fab Finds! f you’re looking for a cool way to create that cool, grungy look, try these studded black flats and pair them with a leather jacket and some black skinny jeans. Make sure to incorporate some color somewhere in there! Oh…my beloved orange. How I adore thee… Orange has got to be one of my favorite colors of the season. It used to turn me off back in the day, but the color can be so vibrant and adds that desirable pop-factor to any outfit. Gotta have some Sperry’s! They are an essential to any shoe collection. And the added metallic gold makes them in season! The best part is, these shoes go with nearly any outfit! A nice girly baby-pink flat that is covered in cute little gold heart studs. It’s a sweet alternative to the sharper look of the black studded flats. The capped flat is also quite a popular fashion statement to make this year. It’s a very classic look that, when incorporated correctly, can be the finishing touch to create a lovely, preppy outfit. Wowzers, look at that pattern! Talk about pop-factor! I am always an advocate of shoes making a bold statement in your outfit. Why not go all out? This black and white striped flat just screams LOOK AT ME I’M STYLISH! I bought these online when I was at college immediately when I saw them grace my computer screen. They are just PERFECT for the summer. TOMS never disappoints when creating comfortable, colorful, and cute shoes, and these have definitely become a staple. I know…I know…3 TOMS? But you can’t deny the power of glitter. And while this purple may seem a little juvenile, I say, go for it! Just make sure that the rest of your outfit is toned down so that these over-the-top TOMS have room to shine. Alrighty everyone! Hope you enjoyed looking through another Fab Finds, and feel inspired to stock up on some flats! I know I sure am! Here’s another Disney Day-inspired look inspired by the first Disney princess, Snow White. No, I’m not talking about the Kristin Stewart version… I tried to add some of my own personal style (ex: my extreme love of polka dots and big rings and bows) to recreate her classic ensemble so that her look can be more wearable. This is probably my number one reason why I have taken up running as my main form of cardio this summer. Working at my summer camp, I am constantly faced with stressful situations and by the end of a long work day my brain has completely marinated itself in stress hormones. Since my camp is at a fitness club, I can just walk across the hallway to the gym and start running. As you exercise, your brain releases endorphins, which are the same hormones released when you eat really yummy food or experience love. It makes you feel good! You’d be surprised at how effective exercise is at relieving stress. I definitely have some friends who would never consider running fun. But after you get into it, you recognize how great you feel afterwards and the physical benefits you receive from doing it. It becomes more of an activity that you enjoy rather than you feel you have to suffer through. 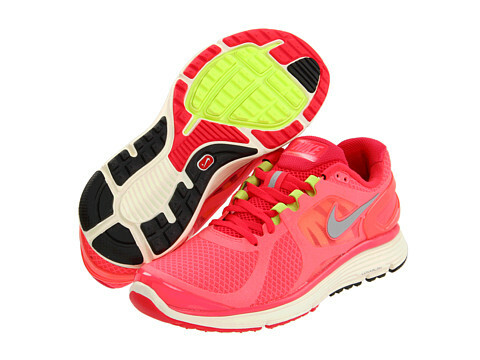 Plus…have you looked at the adorable running sneaker options there are? I personally own a pair of Nike running shoes that include the Nike ID chip. If you have an iPhone like me you can buy an app that will connect to your chip and act as a GPS and it tells you how fast you run, how far you run, how many calories you burn in a run, and it allows you to connect with other runners in your area. Plus…they come in so many AMAZING COLORS! Running is an activity that can be fun and enjoyable to do with a friend, a group, or even just by yourself. For me, running is a great chance for me to have some well-deserved me-time when I am constantly surrounded by people every day. In the midst of being surrounded by my family, my friends, and people at my job, it’s nice to know that at the end of the day I will have an hour or so to myself. This way, running not only benefits your body, but also your mind. By creating a running schedule or even just incorporating running into your fitness regimen a little bit can offer you so many benefits and helps to create a better you. It combines elements of self-discipline, responsibility and commitment, and health consciousness, which, as I said above, benefits you not only physically, but also mentally. I certainly feel a lot more confident in myself and more in control of my body and mind with my 5-day a week running schedule. My dad and I have even signed up for our town’s annual 4th of July 5k. So I hope you enjoyed this post, and maybe…just maaaaaybe I have convinced you to try some running. Even if you can only go for 10 minutes, do it. Just do it. Trust me, you’ll thank me later.